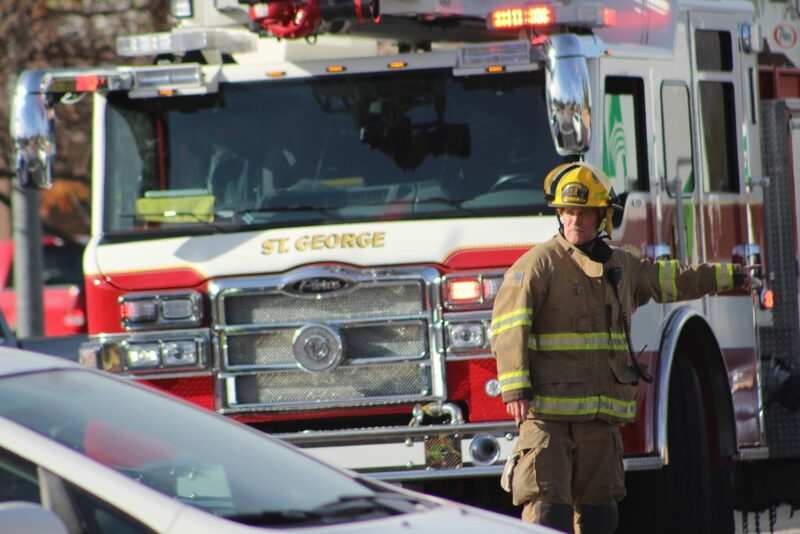 ST. GEORGE — Sometimes music is the only thing that can take your mind off your problems but one driver learned Tuesday that the rhythm can get you into trouble. 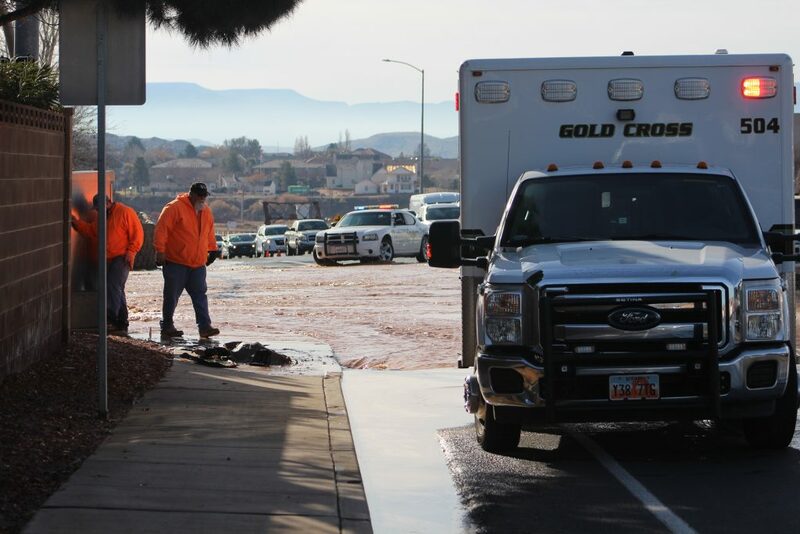 Just after 10 a.m., officers from the St. George Police Department were dispatched to the scene of a two-vehicle collision at the intersection of River Road and Riverside Drive, where they also found a river of water flowing from a damaged fire hydrant down the road, disrupting traffic. Minutes before, a black Toyota SR5 was traveling northbound on River Road when the driver just couldn’t resist the need to feel the beat and picked up his phone to change the song. 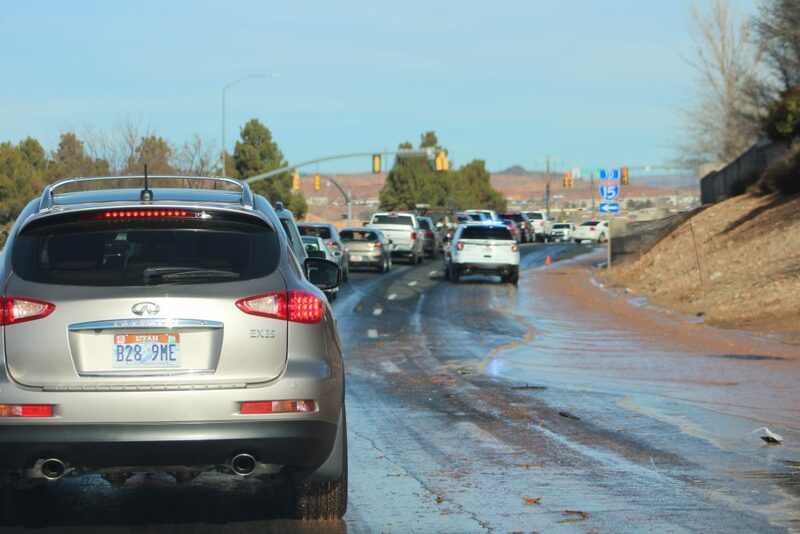 While distracted, he ran through a red light and was hit by a blue Hyundai Elantra traveling east on Riverside Drive, St. George Police officer Tiffany Atkin told St. George News. 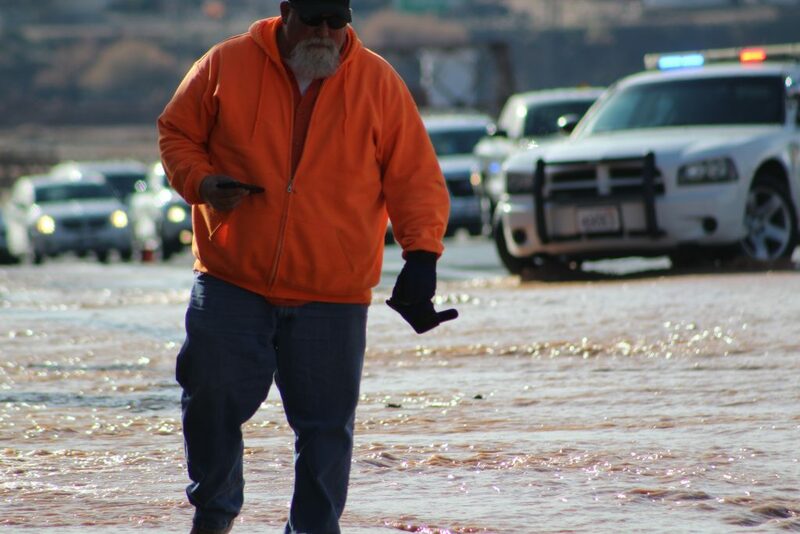 “He was cited for careless driving for being on his phone while committing a traffic offense,” Atkin said. 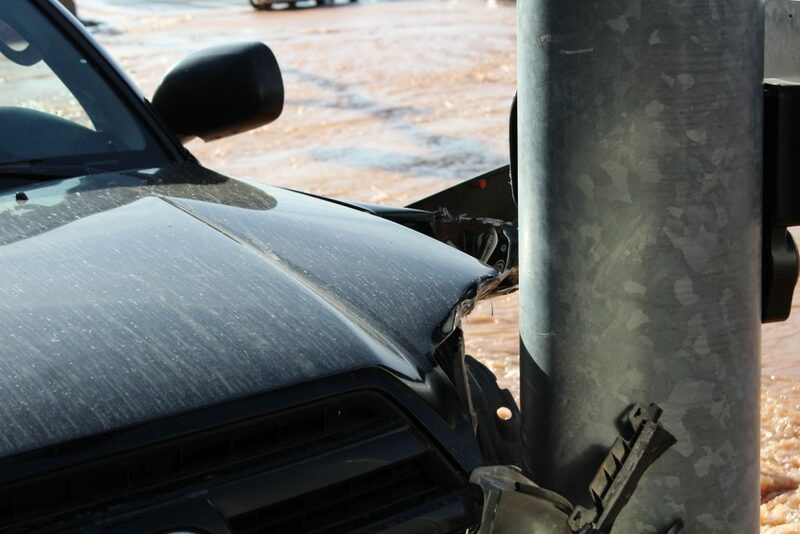 The resulting collision forced the SR5 through the intersection, where it slammed into a fire hydrant and light pole on the northeast corner. 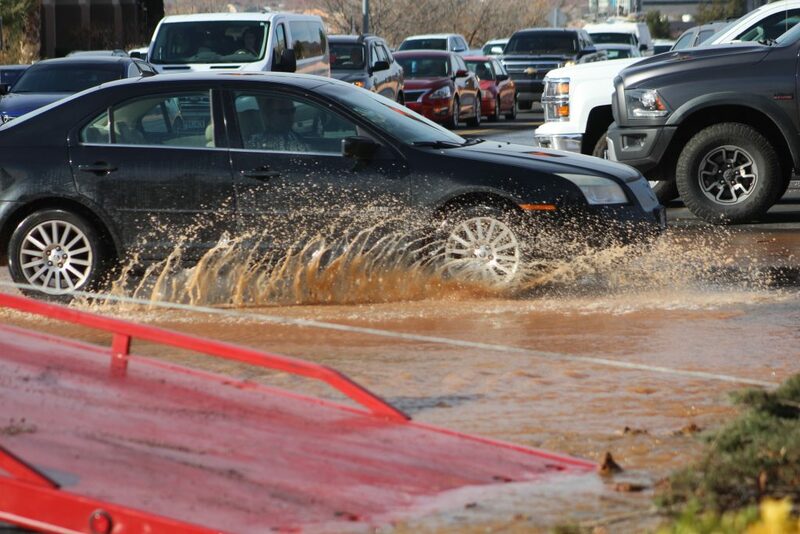 The Elantra spun around toward the opposite sidewalk. Gold Cross Ambulance arrived at the scene but nobody needed to be immediately transported to the hospital. 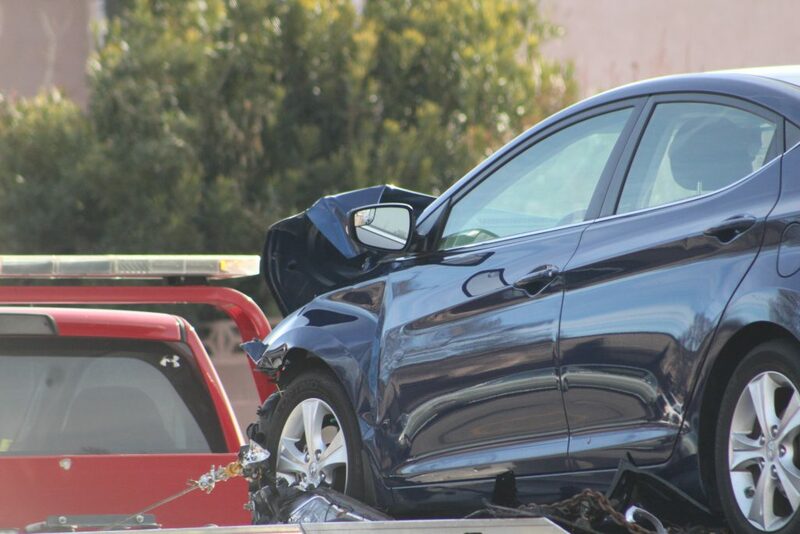 The driver of the Elantra was taken by a personal vehicle to receive medical attention for a possible arm injury, Atkin said, perhaps from being struck by the vehicle’s airbag. 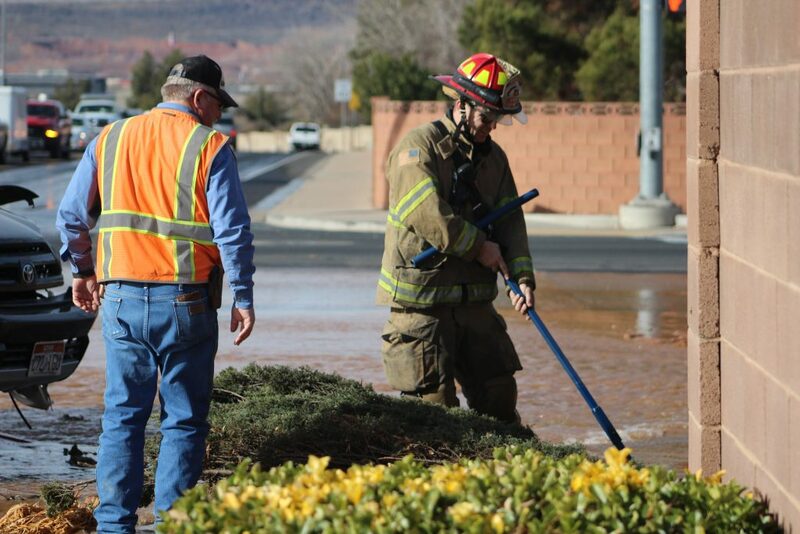 Crews from the city initially had some difficulty locating the correct valve to shut off the water and some landscaping and a tree succumbed to the soggy sinkholes created by the flow. 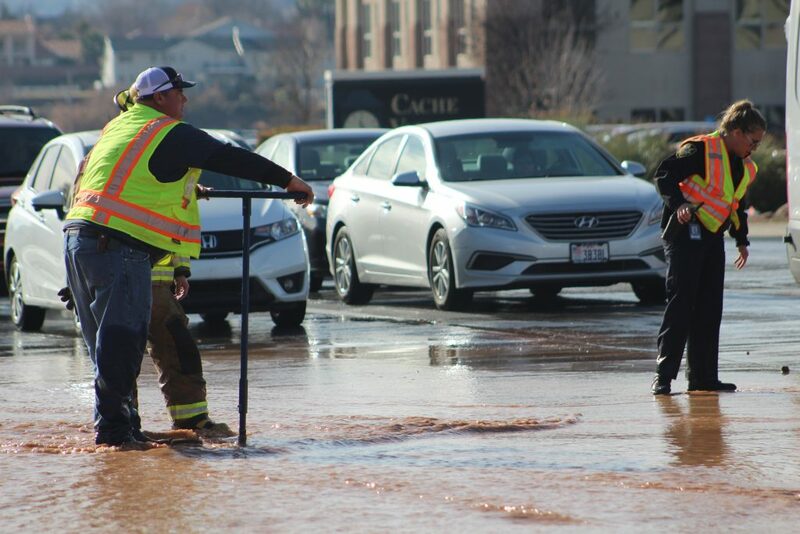 Up to their knees in water, members of the St. George Fire Department stepped in with their tools to assist while troopers from the Utah Highway Patrol helped city police with directing hundreds of cars around the scene. 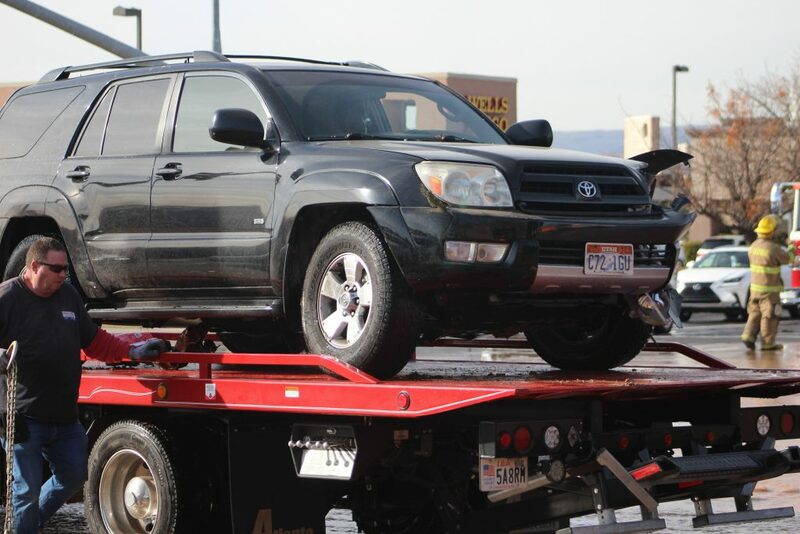 Both vehicles were a total loss and had to be towed from the scene. 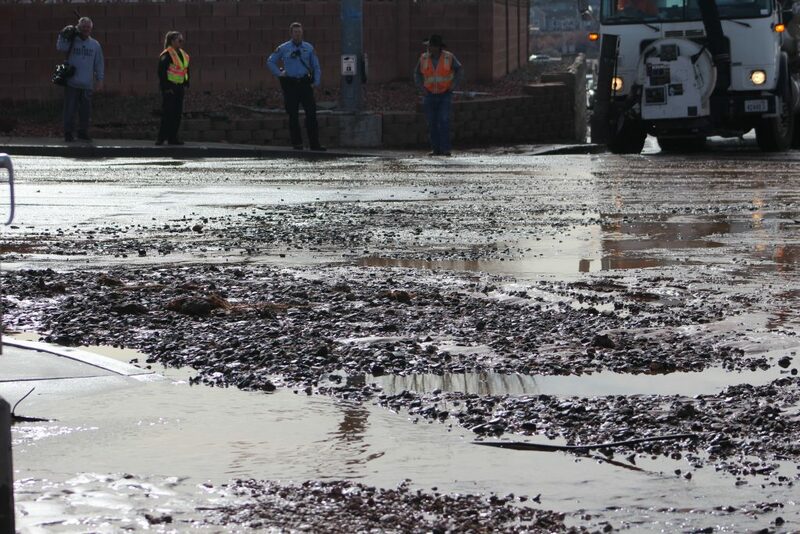 Despite the major disruption to traffic and many impatient drivers fighting their way through the muddy mess, no secondary crashes were reported and crews were able to clear the roadway within two hours. There’s no such thing as a ‘Toyota SR5’. Put that on the list with the ‘kia ultima’. Right. That really bothered me too. 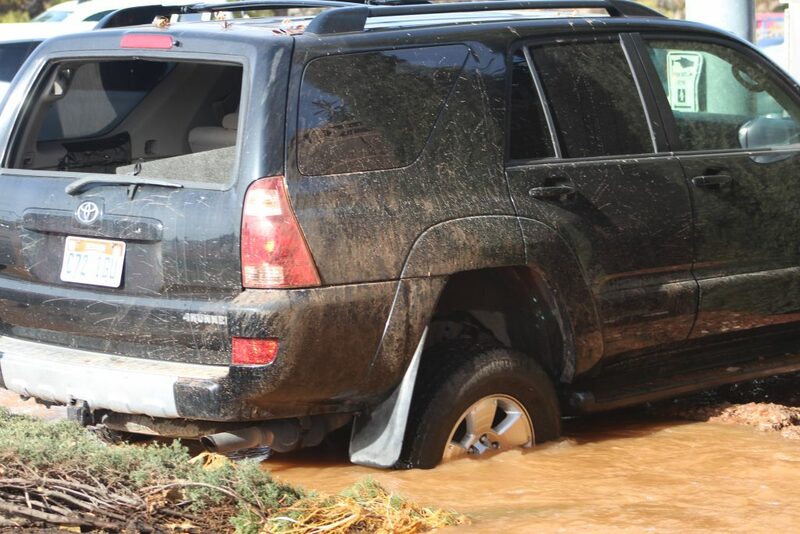 The model is a 4Runner and the trim package is SR5. 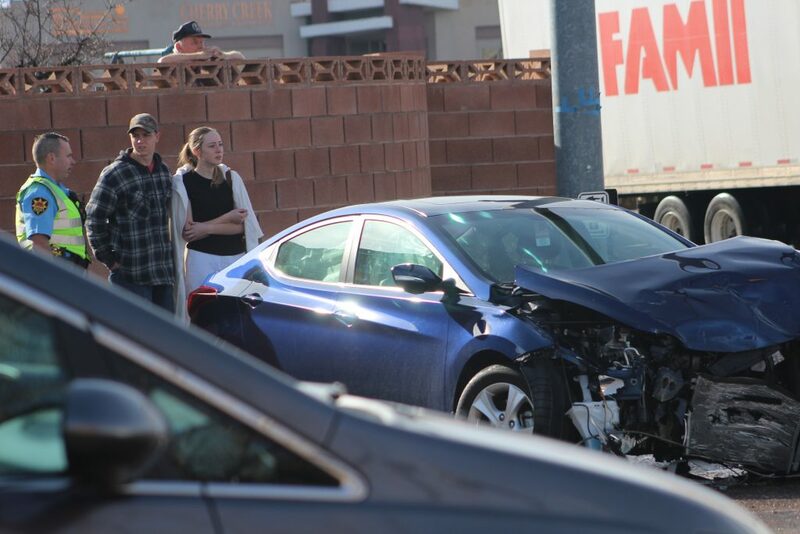 Also, I’m lucky it wasn’t me that got hit… I passed through this intersection moments before this accident happened. Hope that driver’s injury isn’t too bad! I honestly wish that the police would start pulling these loud booming cars over and giving them really expensive tickets for disturbing the peace and distracted driving. There’s no way you can hear an ambulance coming when the music is played so loud. 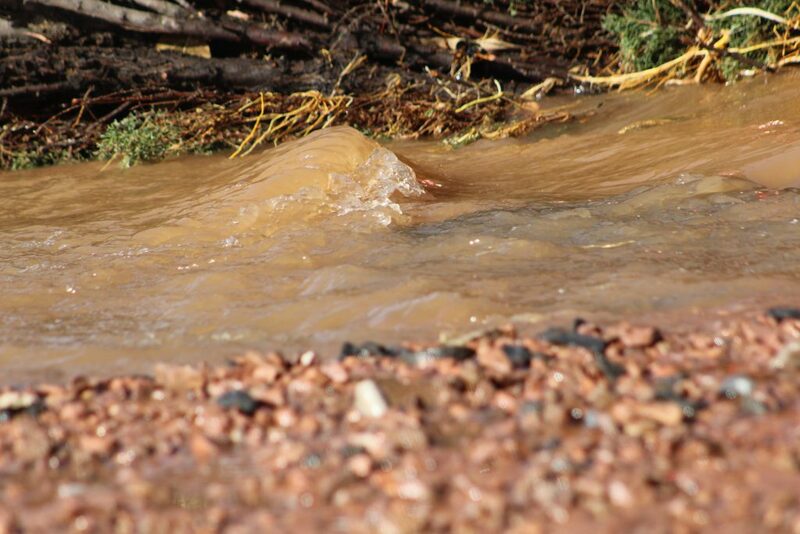 It endangers them and other people driving nearby them. Woo hoo, another citation! That’s the kind of justice we need. 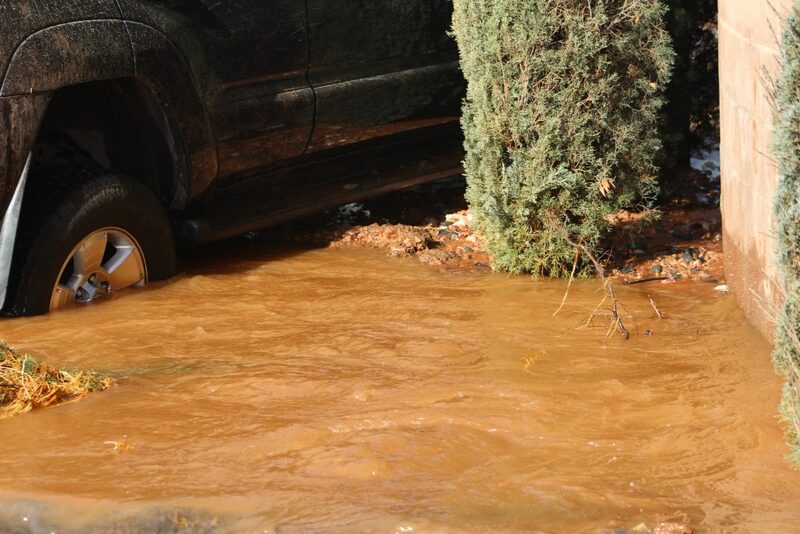 Also, how much will the driver be charged for the hydrant and property damage? Live and learn eh ?